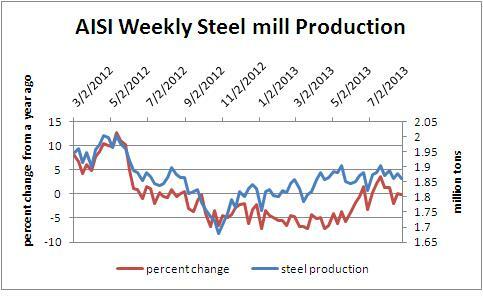 Steel production for the past week fell slightly from the prior week and a year ago. Looking at the actual production levels, steel production remains below the full utilization and remains stagnant. Steel demand remains stable and suggests stable demand without further erosion of market conditions and no growth to more demand. But the United States does not have to resign itself to sluggish growth. Game changers: Five opportunities for US growth and renewal, a new report from the McKinsey Global Institute (MGI), identifies specific catalysts that can add hundreds of billions of dollars to annual GDP and create millions of new jobs by 2020. Increased investment in infrastructure, with a new emphasis on productivity. The backlog of maintenance and upgrades for US roads, highways, bridges, and transit and water systems is reaching critical levels. The United States must increase its annual infrastructure investment by one percentage point of GDP to erase this competitive disadvantage. By 2020, that could create up to 1.8 million jobs and boost annual GDP by up to $320 billion. The impact could grow to $600 billion annually by 2030 if the selection, delivery, and operation of infrastructure investments improve. But the good news is that the more oil and gas we find that’s recoverable, the less we’re at the mercy of events around the globe that could cut off our supply. Imagine a share of stock that will pay you $100 in dividends every year for the next, say, 100 years. How much is that worth in today’s money? How much would you pay for that stock? To know the value, you have to apply a relevant “discount rate” — in layman’s terms, and with some oversimplification, you have to know what interest rate you could get on the money if you didn’t buy the stock. In May, you knew you could earn 1.6% a year, at least for the next 10 years, if you left your money in ten-year Treasury notes. Applying a 1.6% discount rate to our stream of $100 dividends produces a value of $4,972. In other words, that’s how much that theoretical stock would be worth, in today’s money, if we use a discount rate of 1.6%. Hike that discount rate to 2.7% — the interest rate on the Treasury note today — and that value collapses by nearly a third, to $3,445. Hike the discount rate to 4.5% — a normal rate on the Treasury — and the value halves to $2,240. To put this in very simple logic: The Federal Reserve has been suppressing interest-rates to boost the economy. That suppression artificially hiked the value of the stock market, by a simple mathematical equation. Now that suppression is coming to an end, interest rates can be expected to rise. That rise ought — again, by a simple mathematical equation — to reduce the value of the stock market. Dramatically. General Motors has adopted a new purchasing contract that would allow it to recover from suppliers the cost of safety recalls — even if a component met GM specifications, says a lawyer for suppliers. The new contract framework also demands unprecedented access to a supplier’s financial information. Under the new contract, which GM began to implement July 15, suppliers can be held responsible if GM later determines that a component the supplier built to GM specs poses a safety risk to consumers, said Sheldon Klein, a lawyer for Butzel Long, which analyzes contracts for the Original Equipment Suppliers Association. 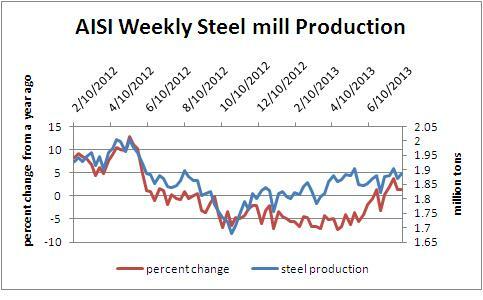 Steel mill production fell slightly from the prior week and from the year ago. 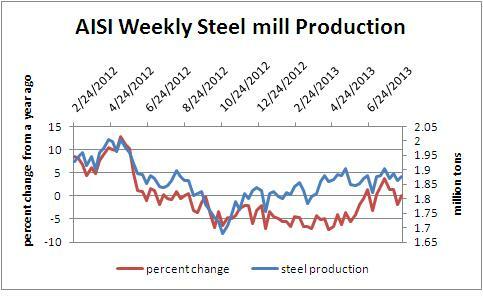 Mill production overall looks flat suggesting stagnant market condition for the future in steel castings. For the past year, steel casting production on a percent change year to year appears to be coincidental with steel mill production and twice the volatility. For the past two months, steel mill production is growing compared to a year ago which was down from the peak levels in early 2012. This suggests that the market demand for steel castings should remain steady. I was recently listening to a business report about the Ford Motor Company expanding into India. Their showrooms offer a ceremony for new cars which include putting a fresh lemon under each tire for good luck with the vehicle. You must stop and think about how this ever got started and why is it continuing today in a modern world which is able to utilize scientific methods to assess needs. As a steel foundryman who has visited many facilities I have seen practices which have gotten my attention in a similar manner. We have given them the name of legacy practices. No one is able to fully explain how or why they work but everyone is sure that they do. Think about your plant. Are you doing things which you cannot explain why? If you want them I can sell you some lemons. There is one vitally important number that everyone needs to be watching right now, and it doesn’t have anything to do with unemployment, inflation or housing. If this number gets too high, it will collapse the entire U.S. financial system. The number that I am talking about is the yield on 10 year U.S. Treasuries. When that number goes up, long-term interest rates all across the financial system start increasing. When long-term interest rates rise, it becomes more expensive for the federal government to borrow money, it becomes more expensive for state and local governments to borrow money, existing bonds lose value and bond investors lose a lot of money, mortgage rates go up and monthly payments on new mortgages rise, and interest rates throughout the entire economy go up and this causes economic activity to slow down. On top of everything else, there are more than 440 trillion dollars worth of interest rate derivatives sitting out there, and rapidly rising interest rates could cause that gigantic time bomb to go off and implode our entire financial system. We are living in the midst of the greatest debt bubble in the history of the world, and the only way that the game can continue is for interest rates to stay super low.